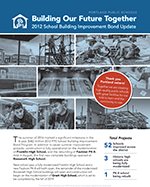 The School Building Improvement Bond that Portland voters approved in November 2012 replaced leaking and deteriorated roofs at 21 schools. In addition, identified roof level seismic deficiencies were included in this work. Roof replacements increase the longevity of the building while improving energy efficiency, indoor air quality and occupant comfort, and reducing the costs to operate and maintain schools in the long run. 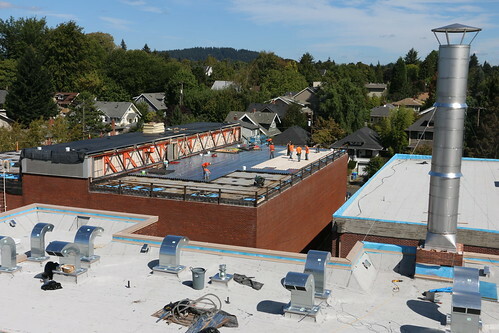 In 2009, PPS replaced leaking roofs at 9 schools with new roofs that featured thin film solar due to partnerships and the incentives available at that time. Abernethy K-5 • Ainsworth K-5 • Alameda K-5 • Arleta K-8 • Boise Eliot PK-8 • Bridlemile K-5 • Buckman K-5 • Chief Joseph K-5 • Cleveland HS • Creative Science K-8 • Creston K-8 • Hayhurst K-5 • Hosford MS • James John K-5 • Laurelhurst K-8 •Maplewood K-5 • Meriwether Lewis K-5 • Sabin PK-8 • Sellwood M.S. •Stephenson K-5 • Wilson H.S. Roof replacements and associated upgrades will occur during summer improvement projects, to minimize disruption of school.